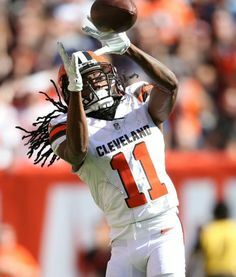 Travis Benjamin is one of the few Browns worth keeping around. It’s Johnny Manziel, it’s not Mike Pettine, it’s not the front office or the owner; it’s the city. The entire city of Cleveland is holding back a franchise from ever becoming a destination. Yes, I know, playing with LeBron James seems to be enough to make people want to come to play. But basketball is a sport that relies on 7 or 8 players for success. Football is a completely different beast. But to be honest, it really is on the front office. Bringing in Johnny Manziel when he wasn’t really wanted by the coaching staff was a dumb move. But the Browns have been desperate for star power, especially since they got a whiff of it with Josh Gordon, before losing him to repeated league violations. And you’d think they’d hold onto the consistent performers through the years and yet they’ve openly shopped Joe Thomas and Alex Mack. I know you’ve gotta try to get as many quality players as possible. And sometimes that does mean trading some guys. But when you don’t have much to begin with you need that offensive line to make those below-average guys into serviceable players. Whether by choice or not, both as a fan of the hated Baltimore Ravens and a college student in Ohio, my first-hand knowledge and experience with the Cleveland Browns is undeniable. However, I’ve already discussed at length how impressive it is that the Dawg Pound continues to exist with all the heart-ache in years past. Hell, this past Monday was pretty gut-wrenching. I even felt bad for those poor SOB’s. With 1969 being the last time Cleveland was in the championship game and 64 being their last championship, these people have been struggling for a long time. And they’ve only had one playoff game in the history of the “new” franchise. In the last 15 years it’s been all about the QB. There’s been so many team leaders (and offensive coordinators) that it’s crazy to expect any kind of continuity as far as results. The only names that jump out to you in their brief “new” history are Trent Dilfer (well after winning the Super Bowl with the Ravens- and by winning I mean not turning the ball over and letting the defense win), Jeff Garcia (who was tried out in Philly before Cleveland and obviously had little left in the tank), and Jake Delhomme (who was declining after the Panthers Super Bowl appearance). Further down the list are guys like Jason Campbell and their most recent starter’s older brother Luke McCown. 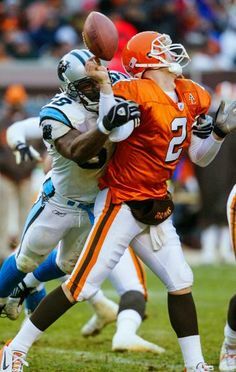 Other retreads that actually began with the Browns include Bruce Gradkowski and Derek Anderson. The only other name of significance is the guy they let walk last year to presumably let Manziel and new free agent Josh McCown battle it out. Meanwhile, Brian Hoyer is starting for the Houston Texans as they make a surge towards a potential playoff appearance. Not saying he would’ve been better than what they have, and I think Josh McCown was as good as he could have been, but the second and third options just aren’t very good. And now that the Browns are finally making a concerted effort to follow everyone else into a pass-first generation it would help if they had someone that could sling the pigskin around the field. The best top draft pick ever. In a league where trades are almost non-existent and players’ career life-span is on average less than 6 or 7 years, free agency isn’t that big of a deal. And if you look at the really successful programs in the NFL, the teams that have done the best over years have done so through the draft. Let’s look at their last 15 first round picks: Tim Couch, Courtney Brown, Gerard Warren, William Green, Jeff Faine, Kellen Winslow II, Braylon Edwards, Kamerion Wimbley, Joe Thomas, Brady Quinn, Alex Mack, Joe Haden, Phil Taylor, Trent Richardson, Brandon Weeden, Barkevious Mingo, Justin Gilbert, Johnny Manziel, Danny Shelton, Cameron Erving. Couch and Brown were horrrendous flops. Warren was solid for other teams and had a decent career but didn’t stick around long. The same went for Faine. Green was good when he played but didn’t play because of drug violations. Winslow and Edwards both had superior talent but neither had the head to keep it together. Wimbley was good for a few years but moreso at the end of his career (not for the Browns). And Brady Quinn was almost a pick for the state of Ohio more than anything else. He just wasn’t a good for a then run-heavy offense. Taylor would’ve been good had he not gotten hurt. But Mack, Thomas, and Haden don’t need any explanation as they are very good players on any team. Yet Richardson is already out of a job and Weeden has outworn his welcome in Dallas. Mingo hasn’t been too impressive so far in his career. Gilbert can’t stay healthy and hasn’t been able to crack the starting lineup, while Shelton and Erving are still yet to be determined as players. So you see, there’s not much to work with in Cleveland. Getting more out of guys like Travis Benjamin, Duke Johnson, vet Gary Barnidge, and a bunch of other journeymen is looking like the best route. But who gets them the ball? And who is going to coach these guys towards the playoffs? Mike Pettine seems like a really nice guy. But that’s not enough. The previous version of this franchise had coaches like Marty Schottenheimer and Bill Bellichick leads them to good years and then win win other teams. Instead of getting coaches with potential who have been good coordinators, Cleveland needs to get someone with a proven track record as a head coach. Tony Dungy would be great. Obviously, the Browns still have a year or two of losing with Pettine to go.